My coat closet has two shelves at the top. 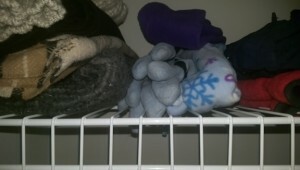 The lower shelf has hats, gloves, and scarves that we use regularly. I tidied the ones on the top shelf and got rid of a few when I started cleaning up my clutter two years ago, but I don’t think any of them have budged since then. About time to send them all on their way! It hasn’t been quite two years since I started writing weekly Clutter Comedy entries; I started posting them in May 2014. But it has been long enough that my husband recently said he thought there wasn’t much clutter left in the house to write about. Of course, no matter how much of it goes out, clutter always builds back up when it gets a chance. He’s probably right, though, that my blog could use some fresh new energy, rather than having so many posts about old junk. So I’ve decided to make a change—today I am “wrapping up” the weekly Clutter Comedy posts, and I’ll replace them by writing about good things that come into my life. When clutter goes out, it leaves plenty of open, inviting spaces for something new and cheerful to come in and play! I don’t yet know what they may be, or how often I’ll find them; but of course, that means it’s going to be an adventure!